Want a discount? Become a member by purchasing Private Coaching - Monthly, Ultimate Transformation Membership, Private Coaching - 12 Weeks or Lifetime Member! If you a bariatric patient that has fallen off plan or regained weight, join this 10 day back on track programs designed to take off the weight. This program is real food and habit based. Join my Lifetime Membership and get this challenge free anytime you want to join! Tosha is so relatable! She knows what you struggle with and that helps! She explains how to work your way through the obstacles. This has helped me tremendously as my weight is really about mind struggles over just food. My focus during this challenge was to be consistent with cardio. I am so proud to say that I have done 45 min on the treadmill every single day. I feel amazing. 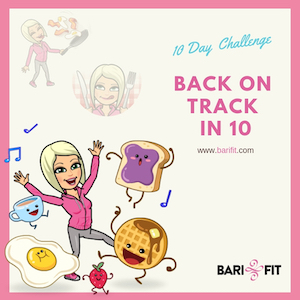 I was able to resist food temptations and stick to structure for the 10 days. I lost my bloat and then some ~ ⬇over 5 lbs. I have lost 24 lbs since January. Tosha’s Back on track program is a great way to kick those bad habits we’ve let back in!! She’s very motivational & has a plan that’s easy to follow. This challenge is so worth doing. I have been with Tosha for a while and this is not my first challenge. The way Tosha presents the topics truly makes you think about your habits and gives you the tools to help you change them. This challenge is more than just about eating. It’s about challenging yourself to change the habits that led you to where you are. Tosha and the group support is awesome. The daily lessons and activities have helped me to make gradual changes to my everyday life. The weight loss is the reward! This is my third challenge with Tosha. They have all been great, but this one was by far the best from my perspective. Tosha went live every day discussing a particular topic that was either a roadblock for some of us or something that could help us get back in track. She is so candid and real and doesn’t sugar coat what we need to hear with a “pretty bow of what we want to hear”. This challenge in particular helped me get real with myself. I can’t wait to do even more!! Not only do I lose pounds and/or inches with every challenge… I gain something new and strong within myself!! Thamk you Tosha!!! !